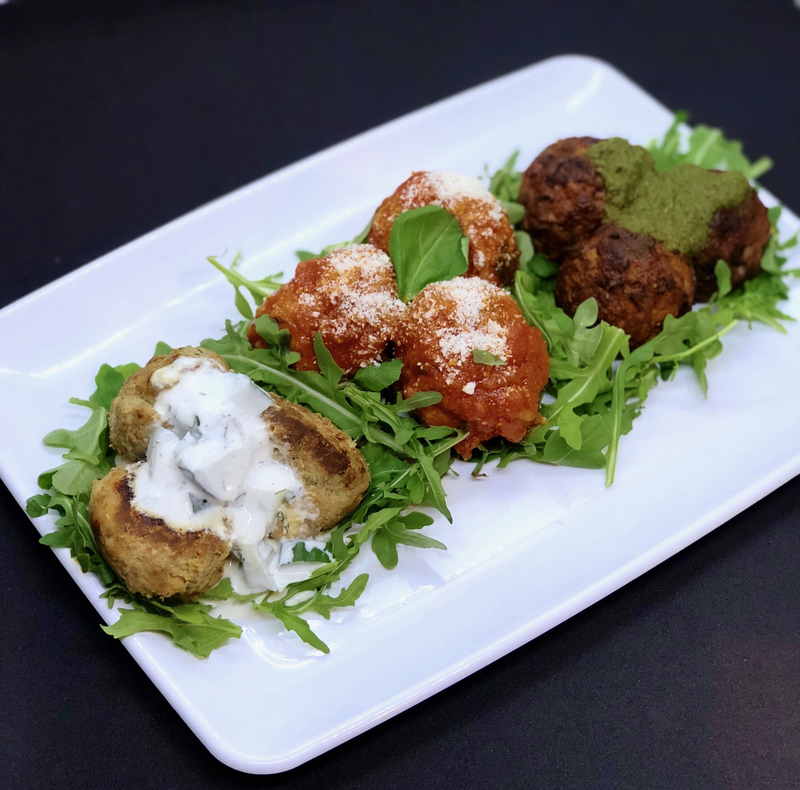 Okay so we don’t mean that we’re going to teach you how to get rich overnight or become really successful….. but we ARE going to teach you how to make 3 different types of delicious meatballs that you can feed to your family and friends! All of the recipes listed below are super easy to make and provide a unique twist on the “traditional meatball”. We’ve also suggested ways to pair each meatball option to dispel the belief that meatballs are only served in marinara sauce or with pasta! So check out your options below and make your favorite one! And if you’re feeling really “ballsy”, why not try em all?! In a large bowl, mix all of the above ingredients together and form into 1 & 1/2 inch balls. Put meatballs in a large skillet with 2 tablespoons of olive oil (or avocado oil). Cook meatballs on medium heat on each side for about 3-5 minutes or until outer layer is brown and crispy. Transfer meatballs to a large pot and cover with sauce (we recommend Rao’s Tomato Sauce but feel free to use your favorite jarred sauce or make your own sauce from scratch!). Cook on low heat for about an hour and a half to two hours, stirring occasionally. Pro tip: Pair these Italian turkey meatballs with some whole wheat spaghetti for a lighter pasta dinner! In a large bowl, mix all of the above ingredients together and form into 1 & 1/2 inch balls. Put meatballs in a large skillet with 2 tablespoons of olive oil (or avocado oil). Cook meatballs on medium heat, turning them every few minutes. Cook for about 20-25 minutes or until cooked through and brown on all sides. Pro tip: Top these Greek turkey meatballs with some homemade Tzatziki Sauce (recipe below) and serve with brown rice and a side of veggies if you’re trying to cut down on the carbs! In a large bowl, mix all of the above ingredients together and refrigerate at least 30 minutes before serving. Preheat the oven to 400 degrees. Drain and rinse lentils and set aside. Add 1/4 cup of olive oil to a large pan. Bring heat to medium/high and add in chopped onions, celery, carrots, garlic, salt and pepper. Stir frequently for 5-10 minutes or until vegetables are tender. Add the tomato paste to the pan and continue to cook for another 3-5 minutes. Add the mushrooms to the pan and continue to cook for another 10 minutes. Once cooked, transfer mixture to a large bowl and let cool. When cool, add in the lentils, eggs, Parmesan cheese and walnuts. Mix by hand until all ingredients are well incorporated. Place in the refrigerator for 25 minutes. Remove mixture from the refrigerator and form mixture into 1 & 1/2 inch balls, making sure to pack the mixture firmly. Use cooking spray to coat a baking sheet and place balls on cooking sheet. Cook for about 30 minutes until meatballs are firm, cooked through and crispy on the outside. Allow meatballs to cool before topping! Pro tip: Try these vegetarian “meat”balls in a whole wheat pita with arugula and topped with chimichurri sauce! YUM! Tag us on Instagram, Twitter or Facebook @foodtoeat with pictures of the meatball recipe that you chose and what you paired it with for your meatball-inspired lunch or dinner! Previous Entry:Celebrate Immigrant Heritage Month with Us: Join Us on Wednesday, June 20th! Next Entry:Immigrants Help Create Economic Growth.